If Murphy stays away, I should be able to send you a couple of the Arduino interface boards for gCN we've been talking about. sweet! those would actually be mighty handy! That would be most excellent. Thanks! Edit: Self-reminder about Cemetech shirts for peeps. So are we only doing the MT3s or are we doing both MT3 and floppy tunes as well? For the MT3s I can definitely bring my speakers and MT3s, if I get the time I should probably make a few new ones as well. I was originally planning on only having the floppy drive display, but I think the consensus from discussing with geekboy and others on HCWP was that it would be cool to be able to either have a single calculator connected to a switch, speakers, and a floppy drive, or have two calculators. Either way, we decided it would be cool to show off both systems. 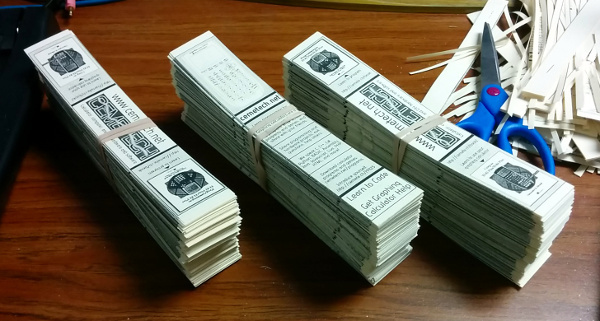 *bump* Roughly 784 bookmarks are printed, copied, and cut out, ready for World Maker Faire 2014! How are the displays going, geekboy? Anything I can do to help? I think we can probably continue discussing how we'll attach the calculators, although at this point adhesive velcro sounds the least destructive and the most removable afterwards. I'm also planning to mention our Maker Faire attendance to our TI contacts to see if they have any thoughts or materials they'd like to provide. I'll agree with the mentioning to Ti Calculators. As for progress still rather slow. Just going over in my head exactly how I want them to look. Funds for materials has been acquired for now yay paychecks. Velcro does sound the least destructive. Even more so if we get a decent brand of Velcro that has removal methods that actually work. Like the stuff that comes off with a hair drier. As always, let me know what I can do to help with creative pondering, Paypalling funds to help with materials, and so on. Ah, neat, I didn't know there was such stuff. In dire straits I usually go after stubborn adhesive with peanut butter. And yeah 3m has a lot of cool products and stuff that make life a lot easier sadly some of them can get expensive but by the same token we all know engineering costs money! I found that the slot-and-tab construction I used for the foamcore boards was both sturdy and easy to construct and tear down, but I suspect that would be much harder to do with woodworking. I'll do a little more research into methods of affixing calculators to boards. How bout some sketches of your tables are going to be laid out, then sketch out the placement of your items? You should convert some Star Wars / other iconic nerdy tunes to MT3, or load mine on with omnicalc. Variety being the spice of life and all that. Where is this year's faire being held? At the Hall of Science in Flushing Meadow Park in Queens, NYC, as in the previous years. You should stop by and say hello! We're under a tent for real? Yay! Also, I need to discuss travel plans with you. Also, how are we fitting 5 people in there? I'll be sure to have the squid and my extension cable as with last year. Five? I thought we had you, me, Qazz, and Geekboy? I know Geekboy said Eeems was planning to come, but I was under the impression he was planning to float around the fair. The squid and extension cord will definitely be key. I'm hoping we might actually even be able to cram a third table into there, but I'm not sure we'll need it. Two sides for tables and maybe the banner hung on the third side could do the trick. I think it will help, as tifreak8x said, if we can start mentally arranging the displays on the tables and see how it works out. Oh boy, a tent! I remember having a tent was much more useful because of things like rain and all. Is the space we're given this year about the same as last? Obligatory "can't wait only 1 more week until the Faire!" It's so exciting! Yes, the space is about the same as the past two years; believe it or not, that first year was also a 10x10 space, more or less. Being under the tent also gave us a lot more traffic, I believe, and it'll be nice to see how that coincides with our experience showing our stuff as well as our spiffier displays that Geekboy is working on. Five? I thought we had you, me, Qazz, and Geekboy? I know Geekboy said Eeems was planning to come, but I was under the impression he was planning to float around the fair. I wish I could float, floating sounds fun. The plan was for me to come down and help. Speaking of, I know it's a little late in the asking, but anything I can do to assist for prep? © Copyright 2000-2019 Cemetech & Christopher Mitchell :: Page Execution Time: 0.168027 seconds.